Another client who trusts in Genesal Energy for their data center, but not only in regards to supply – the whole logistics management was taken care of, including the cutting off of the street, the heavy-duty crane for the genset’s placement, verification of the power cable connection, connection of the alarm cabeling with the building’s centralized system, exhaust gas piping and load tests. All carried out from midnight to 6 AM in order to not interfere with the centre’s day-to-day. And of course, we’ll carry out the required maintenance works with a 24 hour service and in a maximum intervention time on site of 3 hours from the call made to our Call Center. The building has been growing, and the existing genset has been coming up short. The client is also aware of the fact that they cannot afford a power outage in their activity, which is why rennovating the generator set was a main goal. 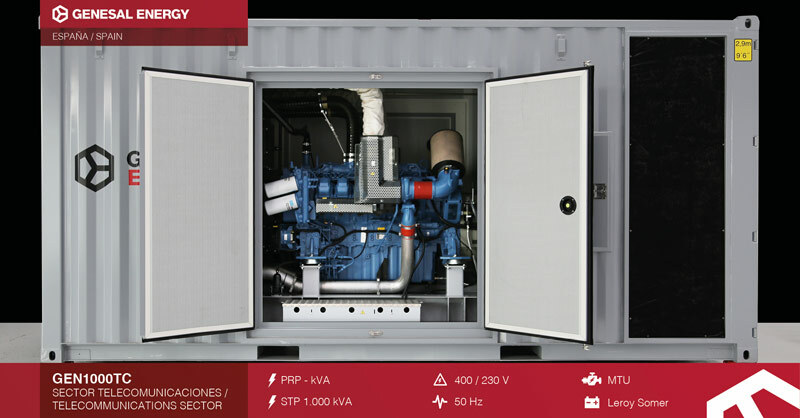 In this first phase, a generator set with an emergency power rating of 1000 KVA and a parallel synchronisation system in a 20’HC container was installed. In the next phase, which we’ve already been awarded with, we’ll supply a unit with identical features, to ensure that the installation has a redundant parallel system.